Panat is a small slaver hideout north of Pelagiad. Its entrance faces northwest on the shores of Lake Amaya. 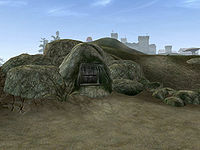 The loot here consists of scrolls, potions, ingredients, clothing, equipment, weapons, soul gems, sundries, gold, jewels, skooma, moon sugar, and books. The battlemage Dravil Omavel holds the Panat Slave Key. 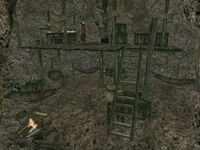 There is also another slave key on the stool next to the Orc on the landing above the slave pit. This page was last modified on 8 September 2018, at 04:02.